Do you want to stay in the Gaeltacht? The winds of change are blowing through the Gaeltacht since 2012. Haven’t you heard? Chun fanacht sa Ghaeltacht agus chun ár stádas Gaeltachta a choinneáil, beidh orainn a léiriú go bhfuil iarrachtaí ar siúl againn an Ghaeilge a chothú agus a chur chun cinn, de réir Acht nua Gaeltachta 2012. What does this mean for us in the Mayo Gaeltachtaí? This new Gaeltacht legislation (Acht na Gaeltachta 2012) signals a departure from the historic emphasis on geographic boundaries and puts the onus on each Gaeltacht community to decide for themselves (i) whether they want to remain in the Gaeltacht (ii) and if so, whether they want to come together to prepare and implement an Irish language development plan for their area. Beidh stádas Gaeltachta ag brath ar na critéir sin, seachas ar limistéir thíreolaíochta amháin as seo amach. Furthermore, Aire na Gaeltachta now has the power to withdraw Gaeltacht status from an area if the community don’t fulfil their requirements under this new legislation. If, for example, they don’t submit their language development plan when asked. Mar sin féin, tá i bhfad níos mó i gceist leis seo ná pleananna teanga agus staitisticí teanga amháin. Acht na Gaeltachta also presents enormous opportunities for each community to direct, promote and sustain their linguistic and Gaeltacht future on their own terms. The Mayo Gaeltacht has been divided into 3 separate language planning areas (i) Maigh Eo Thuaidh (Iorras) (ii) Maigh Eo Thiar (Acaill) (iii) Tuar Mhic Éadaigh has been coupled with Dúiche Sheoigheach i gCo. na Gaillimhe. Did you know that approximately 19% of the Gaeltacht is located in county Mayo? 10,886 people live in these areas according to Census 2011, which represents roughly 11% of the entire Gaeltacht population. Is teanga bheo labhartha í an Ghaeilge fós i gceantair áirithe i gcontae Mhaigh Eo. An interim working group has recently been formed in the Maigh Eo Thuaidh area under the guidance of an independent language planning specialist, an Dr Laoise Ní Dhúda. 7,575 people or 70% of the Mayo Gaeltacht population live in this area, which spans from Fód Dubh to Béal Deirg, Ceathrú Thaidhg to Dumha Thuama and everywhere in between. The aim of this group is to begin preliminary discussions and preparatory work required for Acht na Gaeltachta in North Mayo. 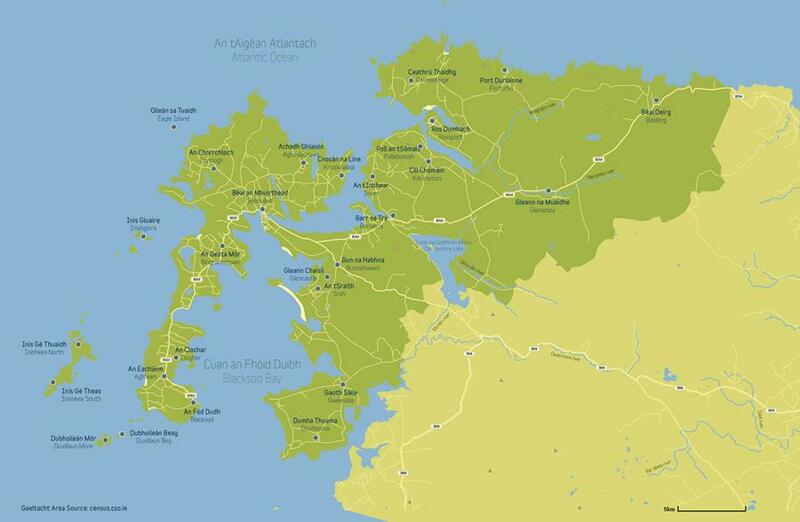 Their overall goal is to maintain and develop North Mayo as a thriving Gaeltacht area. Instead of sitting back and expecting linguistic miracles to happen without any change, representatives from each parish in this Gaeltacht area decided to get the ball rolling themselves. They hope that you’ll be happy to join them on this journey. Tá todhchaí na Gaeilge agus na Gaeltachta i Maigh Eo Thuaidh ag brath ortsa agus orainne. At the end of the day, the future of the Irish language and the North Mayo Gaeltacht depends on you and me. This group believes in a positive future for the North Mayo Gaeltacht. We are all well versed in the linguistic, cultural, social, educational, economic and associated benefits of the Irish language and Gaeltacht status – or are we? Céard is fiú dúinn an Ghaeilge agus ár stádas Gaeltachta? Should we try to maintain our Gaeltacht status? An gcoinneoidh muid an Ghaeilge agus an Ghaeltacht slán? Will we secure the Irish language and our Gaeltacht area for future generations? Can we afford to let our Gaeltacht status go? What do you think? Is féidir leatsa difríocht mhór a dhéanamh ach is féidir linne, le chéile, an t-uafás a bhaint amach má sheasann muid le chéile. Tá rogha le déanamh ag gach duine anois. So it really is decision time for every person living in the North Mayo Gaeltacht, tá uair na cinniúna buailte linn. We’ve reached a point of historic significance regarding our Gaeltacht status and there can be no turning back. What can you do? Whether you’re young or old, a parent, a committee member, a cainteoir dúchais, or a concerned member of the community, we ask you to déan do mhachnamh féin, have a think about this and decide what you want. Please also come along to our public meeting in Áras Inis Gluaire, Béal an Mhuirthead on Wednesday 4th November 2015 at 8pm and have your say. Fáilte roimh gach duine. You can email us at gaeilgeiniorras@gmail.com chun breis eolais a fháil nó chun spéis a chlárú linn. Bí linn ar mhaithe le ár gceantar agus ár dteanga. Bíodh misneach againn, is linne an rogha agus is linne an Ghaeltacht. Together we have the power to secure a positive future for our Gaeltacht. Organisations and community groups from North Mayo have been officially invited to submit applications to Údarás na Gaeltachta before 22.11.2015 to become the lead organisation responsible for language planning in North Mayo. This entry was posted in Eachléim Notes, Events, News, Uncategorized by Bainisteoir CFID. Bookmark the permalink.